The attack on a Pittsburgh synagogue that claimed the lives of 11 people and wounded six began before 10 a.m. Saturday, authorities said, when suspected gunman Robert Bowers drove a green Hyundai Sonata to the neighborhood of Squirrel Hill. He began shooting before 9:45 a.m. as services were underway at the Tree of Life Synagogue, they said, and police were called to reports of shots fired. What happened next is based on police radio feeds, law enforcement sources and public statements. 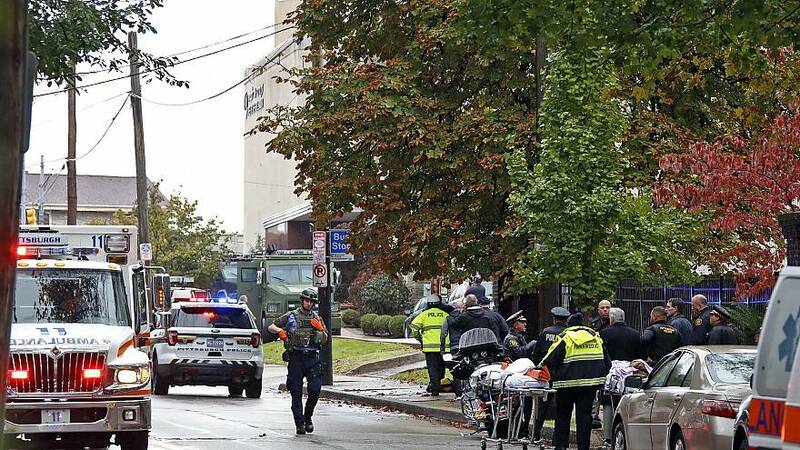 "After he entered the synagogue, it looks like at that point he murdered the 11 [worshippers]," Bob Jones, special agent in charge of the FBI's Pittsburgh office, told reporters Saturday. Police said Bowers was on his way out of the synagogue when police arrived, and there was an exchange of gunfire. He shot two police officers and sustained multiple gunshot wounds, authorities said. Bowers allegedly went back inside and continued to exchange gunfire with officers. Pittsburgh Police Chief Scott Schubert told reporters two SWAT officers were injured inside the building. One SWAT officer was shot in the arm, and a tourniquet was applied to stop the bleeding, according to radio transmissions. Authorities believe the suspect was in the synagogue a total of 20 minutes. SWAT members told their colleagues the suspect was armed with an AR-15-style assault rifle, as well as a handgun. In a separate room, police found a military-style bag. A bomb squad checked it for explosives but did not find any. Bowers was asked by police to surrender, which he eventually did, giving them his name and date of birth. During this back-and-forth, according to radio transmissions, he was making anti-Semitic statements. While Bowers was being taken into custody, police searched him and allegedly found two other handguns. Police located the Hyundai that Bowers drove to the synagogue, and it was searched by bomb squad officers. No explosives were found in the car.